Dumas Paris inaugurates its first blanket, an exceptional product inspired by the traditional bed blanket of yesteryear. 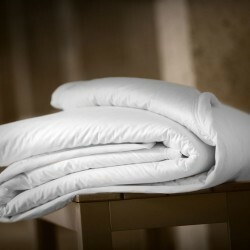 Immerse yourself in the softness of this warm blanket made in the most beautiful materials. The natural filling adapts to the temperatures and offers this incredible sensation of sleeping on a cloud, in all seasons. The perfect combination of the down layer wrapped in a white cotton satin ensures an extreme lightness and offers a great softness. This premium blanket is available in different dimensions adapted to a bed for 1 person as a bed 2 people.